U.S. Suspending Millions In Military Aid To Egypt : The Two-Way Hundreds of millions of dollars in military aid, including jets, tanks and helicopters, will be cut off in response to the ouster of President Mohamed Morsi and a deadly crackdown on his supporters. 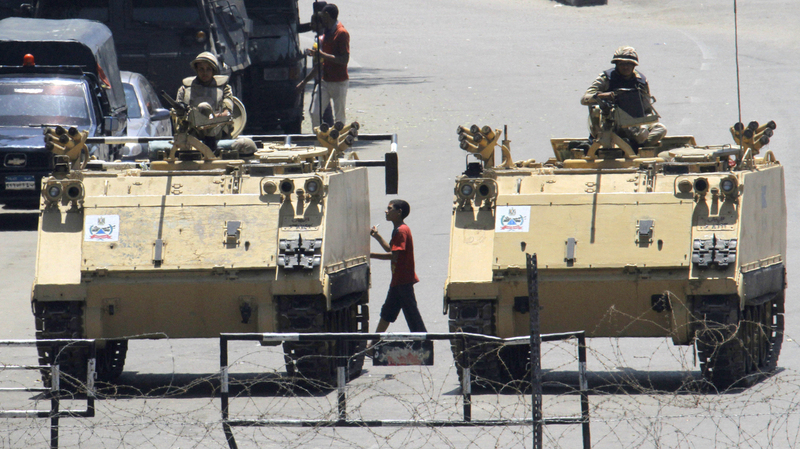 Armored vehicles blocking Tahrir Square in Cairo, Egypt, in August. The State Department says the U.S. is "recalibrating" the assistance it provides Egypt. The decision follows a review sparked by a series of attacks by security forces on supporters of ousted President Mohamed Morsi that ended in hundreds dead. A shipment of F-16 fighter jets was quickly suspended as were joint exercises planned with the Egyptian army. In a statement, State spokesperson Jen Psaki said the U.S. will continue to have a relationship with the Egyptian government, but will continue to delay delivery of some large-scale military systems, as well as suspend some "cash assistance to the government pending credible progress toward an inclusive, democratically elected civilian government through free and fair elections." The U.S., however, will continue to provide support to help "secure Egypt's borders, counter terrorism and proliferation, and ensure security in the Sinai." "The United States will withhold deliveries of Abrams tanks, F-16 aircraft, Apache helicopters and Harpoon missiles from Egypt as it cuts back on aid, a congressional source said. "Washington also plans to halt a $260 million cash transfer and a planned $300 million loan guarantee to the Cairo government, the source said, after members of Congress were briefed by officials from the U.S. State Department about the administration's plans." The White House is "poised to slash hundreds of millions of dollars in military and economic assistance" to Egypt following last summer's coup and the deadly crackdown on supporters of the Muslim Brotherhood. That's the word from The Associated Press, which says the official decision from the Obama administration should come this week. That decision "will hold up the delivery of several types of military hardware to the Egyptian military," The New York Times writes, quoting several unnamed administration officials. The items include "tanks, helicopters and fighter jets. But it will not affect aid for counterterrorism operations or for border security issues involving the Sinai Peninsula and Gaza," the newspaper says. The AP says the move will "likely have profound implications for decades of close U.S.-Egyptian ties that have served as a bulwark of security and stability in the Middle East." "The U.S. provides Egypt with $1.5 billion a year in aid, $1.3 billion of which is military assistance. The rest is economic assistance. Some of it goes to the government and some to other groups. Only the money that goes to the government would be suspended." The Times, quoting officials, says the U.S. will also suspend "nonmilitary aid that flows directly to the government, but not support for other activities like education or hospitals." White House Press Secretary Jay Carney says "we are not proceeding with the delivery on certain military systems," but that "reports that we are halting all military aid are false." "We will have a decision to announce once we have made appropriate notifications," Carney says.